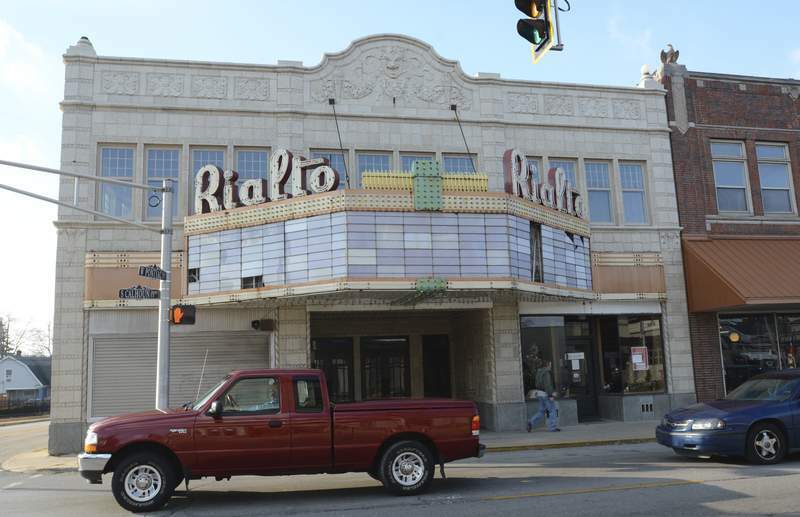 Cathie Rowand | The Journal Gazette Former Rialto theater on S. Calhoun is up for sale, $249,000. The non-profit organization that has tried for more than a decade to restore the historic Rialto Theater at Calhoun and Pontiac streets is putting the 91-year-old theater up for sale. Jeff Jacobson, board president of The Reclamation Project, which bought the theater in 2003, said fundraising to restore the theater was strong in the first five years, but then fundraising efforts "hit a brick wall" after the economic downturn that started in 2007 and 2008. The organization launched an effort in 2012 to find new partners to help restore the building, but "It got to the point where we weren't getting donations," so the organization will try to sell the place, he said. The building has 18,462 square feet and the auditorium seats 700. The price is listed as $249,000, according to BND Commercial Real Estate Solutions, the firm listing the property. Jacobson said a tremendous amount of work has been done on the building, which had water damage when the organization bought it. A new roof was put on at a cost of about $100,000. The plumbing and electrical systems have been replaced, and the Reclamation Project got a facade grant in 2014 from the city to improve the front. Much of the work, Jacobson said, was done by donated labor. "We finished a lot of work," he said. But the main auditorium remains to be restored and there is a lot of junk in the theater that has to be removed. "At least it's preserved" so the building will suffer no damage while sitting unused, Jacobson said. "We're just hoping someone with the means and the passion" to restore the building will buy it. Jacobson estimated the theater is a $2 million project start to finish, but about half a million dollars in work has already been done. The area where the theater sits is ripe for investment, Jacobson said. It's part of an improvement corridor launched by the city. The city and local business owners will be working with architects to beautify the stretch from the underpass on the north to the theater, he said. "To a certain extent it's worked out," Jacobson said of the organization's decision to buy the building 12 years ago. Parts of the interior have been restored and serve as offices for The Reclamation project and as a translation center.